KTM comes out of the gate early with their release of the 2019 EXC, XC-W and XC line up. 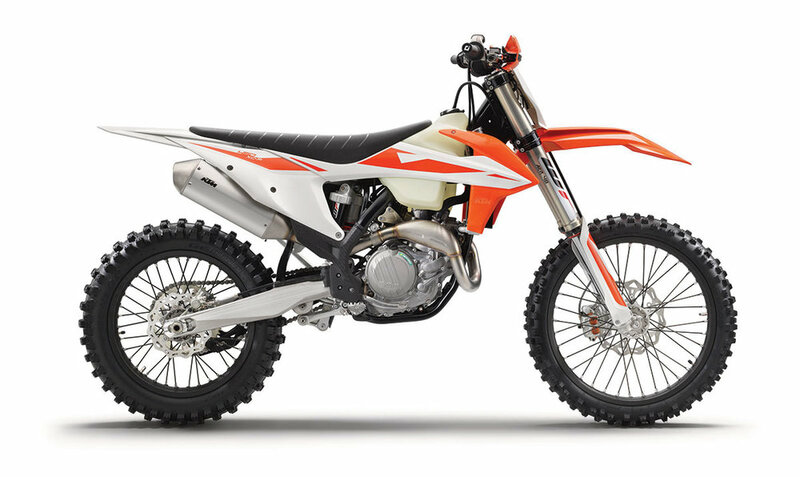 You will notice that some of the 2018.5 450 SX-F Factory Edition changes have spilled over to the off-road lineup and it looks like KTM is also bringing both the 250 and 300 XC-W TPI bikes to North America this year. Read all about KTM's 2019 off-road model lineup below. All XC models feature new high-tech and lightweight chrome-moly steel frames in various profiles patterned after the SX design, including hydro-formed elements produced by WP Performance Systems with state-of-the-art robots. They have the proven geometries as before but due to a re-design in several areas they feature an optimized stiffness (longitudinal + 2%, torsional + 10%) compared to the predecessor versions which provides better feedback to the rider, more precise handling and improved stability without compromising comfort. The laterally attached engine head stays (the connection between cylinder/head and frame) are now made in aluminum for all models (new for 250 XC and 300 XC) and contribute to precise cornering and a reduced vibration level. Newly designed frame guards feature a structured surface improving the grip and the right one also serves as a heat protector for the muffler. On the 4-stroke frames, three new brackets in the lower part of the frame allow the fixation of an optional composite skid plate offered in Power Parts, in the 250and 300 XC frame the engine is raised by 1° around the swingarm pivot improving the handling and the grip of the front wheel. All XC models come with a tucked in frame-mounted side stand. The subframe is made of extra-light and stable aluminum profiles, which weighs less than 900gr. For better rear fender stability it is 40 mm longer than before. All models are fitted with a reworked cast aluminum swingarm featuring a longer slot for the rear axle. This allows the adjustment of the rear wheel in a position up to 5 mm further back which gives the rider the option of gaining more straight-line stability for fast tracks and whoops. The single-component casting process offers low weight and a perfect flex behavior. All factory riders were involved in shaping the new bodywork of the XC models together with the specialists from KTM R&D and Kiska Design. The results are all new plastics that provide perfect ergonomics and contact points for the rider, maximum freedom of movement and improved handling. In addition, the I-beam design for the front and rear fenders are prime examples of an intelligent design, which guarantees maximum stability at lowest weight through a well thought-out structure and mounting. A newly shaped seat provides improved ergonomics and better seat comfort. Due to newly developed silicone strips the seat cover provides better feel and grip. The fixation of the seat with one long, lateral screw is safe and easy to remove and install. The new airbox has been completely reworked ensuring better airflow towards the engine for optimal performance and throttle response. In addition, the new design offers maximum protection of the air filter against soiling. Together with new intake snorkels (except for 125cc) this leads to further improved engine performance. The large Twin-Air air filter is mounted on a stiff cage, which provides the fixation of the system at the same time. The simple design also minimizes incorrect installation of the filter and cage. The filter can be changed without tools in seconds, a standard, original feature by KTM. All models of the XC range are fitted with newly designed lightweight polyethylene tanks improving the ergonomics with a capacity of approx. 2.4 gallons of fuel for the 4-stroke XC-F’s and 2.65 gallons for the 2-strokes XC bikes. The filler cap features a ¼-turn bayonet mechanism with an orange quick-release button for extra fast refueling. All fuel-injected models are fitted with an integrated fuel pump system and an additional fuel level sensor, which indicates low fuel level via a warning light. The engineers put a lot of effort into developing completely reworked exhaust systems for all models. When it comes to improved power delivery and performance of the new bikes the new exhausts plays a key role and they are hard to beat by any accessory exhaust systems. In addition, they provide the slimmer ergonomics while being safely within the noise limits for racing. The four-strokes are fitted with new, model-specific header pipes showing a further advanced resonator version called FDH (Flow Design Header), which is a small chamber around the pipe. This is a unique standard feature, well integrated into the pipe, making the front part of the exhaust slimmer and providing better engine performance and reduced noise. The 2-strokes shine with new exhaust pipes made by WP in an innovative 3D process which further improve the performance. The 250/300 XC pipe features reduced width and more ground clearance and due to the new shape, it is stronger against hits and deformation. In terms of performance, it allows a higher over-rev of the engine giving the 250 XC and 300 XC even livelier engine characteristics. All models are fitted with new silencers featuring reworked internal designs individually developed for each model. The plastic holder of the 2-strokes mufflers is now replaced by lightweight, welded mounting brackets. In addition, new perforated inner tubes work together with a new and lighter silencer packing for more efficient and more durable noise reduction. Weight reduction approx. 300gr. The 4-stroke mufflers feature a new profile of the aluminum sleeve and a new end cap as well as a reworked internal design. A longer connecting pipe of the muffler moves the split between header pipe and muffler further in front. This improves the user-friendliness because the exhaust system can now be disassembled without removing the shock absorber before and allows better access to the shock. All XC models are equipped with a tapered handlebar made of high-strength aluminum by NEKEN, which is fixed in rubber damped handlebar mountings allowing the handlebar to be mounted in two different positions. All models are all fitted with ODI volcanized grips on the right side while on the left side of the bar a comfortable ODI lock-on grip is mounted, which does not require any wire or glue to be fixed. All XC models come standard with hand protectors. A reworked bar pad featuring a newly designed cover can be fixed easier to the handlebar. The TRACTION CONTROL is a unique feature. With its new setting, it guarantees even more efficient traction and better control of the bike when accelerating the bike, especially on wet tracks. It can be activated by the handlebar map switch during riding. With a simple push of the two buttons at idle speed, the rider can also activate the LAUNCH CONTROL which provides more efficient starts out of the gate by reducing the maximum engine speed for the very first moment of the start to give better control. Thanks to a reworked set-up the Launch Control now benefits automatically from the Traction Control during acceleration in order to reduce wheel spin for maximal possible traction. The EFI control lamp mounted on the upper triple clamps indicates when the function is active. In addition, the map switch gives the rider the chance to select an alternative, more powerful map beside the standard configuration. All XC-F engines are fitted with the proven electric starter – a unique KTM feature and a major benefit at all levels of motocross racing. A new and more capable, super lightweight 2 Ah Lithium-Ion starter battery provides even quicker starting of the engine especially at cold weather conditions and contributes to the low vehicle weight. A reworked packaging of the voltage regulator and condenser concentrate the electrical components in a common area below the seat and make the entire system even more reliable. New modern graphics highlight the new generation of cutting-edge KTM bikes. Still feature in-mold design. All models feature newly designed radiators made by WP Performance Systems which are mounted 12mm lower than the predecessors. This lowers the center of gravity and in conjunction with a new radiator shape, they match perfectly with the design of the new spoilers to make the bike narrower and easier to get forward on the bike. Thanks to CFD calculated liquid circulation and air ventilation the entire system was improved. Also, a reworked coolant tube integrated in the frame triangle features 4 mm larger center tube increasing the cross section by 57%. This makes the coolant flow from the cylinder head to the radiators more efficient. A sophisticated design of the new radiator guards integrated in the front part of the spoilers provides efficient protection for the new radiators in case of crashes. High-tech Brembo brakes have always been standard equipment on KTM off-road bikes, and are combined with lightweight Wave discs. The DDC monoshock made by WP Performance Systems has been developed in conjunction with the entire frame and swingarm architecture, including the linkage system and the AER 48 forks. An updated main piston and new settings provide improved damping characteristics and match perfectly the reworked front fork set-up. Fully adjustable including high- and low-speed compression you can set the shock to any offroad conditions and riders preferences. All models are fitted with the super-lightweight WP AER 48 front fork, a 48 mm USD air-sprung fork developed by WP Performance Systems in close collaboration with KTM. It is a split fork with separate functions for each fork leg. That means damping functions are on the right side, whereas the air spring is in the left. The left leg features a two-chamber system with a capsuled air cartridge to prevent loss of air pressure e.g. spring force. That means in case of a leaking outer seal the internal cartridge pressure keeps the bike in position. The air spring is easy to adjust to any rider weight via a single air valve. No special tools are required, the air pump supplied with the bike is enough. The right fork leg integrates a damping cartridge to fit single damping leg requirements. Damping can be adjusted to the riding conditions and the rider’s preferences (compression from top, rebound from bottom, 30 clicks each). Top quality, CNC machined triple clamps have been something of a KTM trademark for years. The new models feature reworked and stiffer upper triple clamps (22mm off-set for all models) which feature an improved stiffness adapted to the reworked frame stiffness and the flex characteristics of the latest fork in order to improve both handling and stability. The rubber damped handlebar fixation reduces the vibration level and allows to fix the handlebar in 2 positions. In addition, an hour meter is fitted at the upper triple clamp in order to keep the rider informed when maintenance should be performed. One target of the KTM engineers when developing the new SX and XC models was a further weight reduction compared to the previous generation. The result is: the current SX models set a clear benchmark again, they are (by far) the lightest bikes in the competition. KTM continues the powerhouse revolution with its range of world-beating 4-Stroke engines. The sheer power, rideability, and performance of the KTM 4-stroke bike make it difficult to beat in all classes. For the MY 2019, all models feature reworked engines and set a new benchmark again when it comes to performance, power delivery and rideability. The 250 XC-F engine is based on the new generation 250 SX-F, with updates on valve timing, exhaust, airbox, and EMS the entire power pack produces even more torque and power across the entire rpm range up to 14,000 rpm. Its compact architecture contributes to an excellent mass centralization. This supports the easy rideability of the bike together with a low weight of only 57 lb, including the incredibly beneficial electric starter. The centerpiece of the compact DOHC (double overhead camshaft) engine is the cutting-edge cylinder head. It features two overhead camshafts which activate the titanium valves (intake 32.5mm, exhaust 26.5mm) via super-light finger followers with a hard DLC coating. The exhaust camshaft features a new timing for improved power delivery. In the short cylinder that has a bore of 78mm, works a lightweight, forged bridged box-type piston made by CP. It features a unique piston crown shape adapted to the combustion chamber and stands out with its extra rigid structure, combined with a low weight. The compression ratio is at 14.4:1. Thanks to the low oscillating masses, the engine displays extremely lively characteristics. The 250 XC-F’s has a rigid crankshaft which features a connecting rod with a plain big end bearing featuring two force-fitted bearing shells run directly on the crank pin. This design is a major prerequisite for the extremely high engine speed levels and the unrivaled maximum power of the 250cc engine. Not only that, it enhances the engine’s durability, allowing long crankshaft service intervals, which is a huge customer benefit in relation to time, effort and cost. In order to balance the mass-forces, the 250 SX-F engine uses a multifunctional counter balance shaft, which at the same time drives the water pump and timing chain. The 250 SX-F is fitted with a unique electric starter as standard, which is well known as a clear advantage when it comes to crunch time in the heat of battle. A strong starter motor made by Mitsuba and the proven starter drive guarantees efficient and reliable starting. The design of the die-cast engine cases allowed for minimal weight and a very centralized shaft configuration. This makes the engine very short and compact while contributing to an efficient centralization of masses. The engine covers feature a surface structure, which reduces the wear caused by the rider’s boots. A newly developed DS (diaphragm steel) clutch features a one-piece clutch basket combined with the primary gear made of high-strength billet steel. It guarantees unbeatable reliability and contributes to the narrow engine size due to its compact rivet-less design. It is fitted with extremely heat-resistant steel carrier friction discs which ensure a good disengagement of the clutch. These are pre-tensioned by means of a diaphragm spring, substantially reducing the operating force required to pull the clutch. The Brembo hydraulic system provides easy and precise modulation. The 250 XC-F uses a new 6-speed transmission made by PANKL RACING SYSTEMS ensuring the highest durability and reliability level. There was no need to change the gear ratios that are perfectly matched to the power delivery. An advanced “NO DIRT” gear lever design prevents dirt from blocking the joint of the lever and guarantees safe activation of the transmission. All four-stroke engines are fitted with a gear sensor giving the option of different engine characteristics for each gear. PANKL is the new manufacturer of the transmission → improved durability and reliability. The state-of-the-art Keihin Engine Management System, with electronic fuel injection, features a new 44mm throttle body, which provides a spontaneous response and maximum performance thanks to its unique injector position. This guarantees excellent atomization of the fuel with the air on its way to the combustion chamber. In addition, there are separate systems for cold start and idle adjustment. A reworked throttle cable mount allows for smoother routing of the cables and better access, an improved seal of the MAP sensor (MAP = Manifold-Absolute-Pressure) makes the system even more reliable. The ECU features new maps adapted to the new exhaust and cylinder head and it regulates the unique traction and launch control. In addition, it provides different maps for optimal power characteristics for each gear according to the information received by the gear sensor. The success story of the 350 XC-F is certainly unrivaled. It has been the bike KTM Factory FMF offroad rider Kailub Russell has used to dominate the GNCC series. Over the years and again for 2019 350 XC-F has gained a lot of performance and torque providing almost as much power as a 450, but with the agility of a 250 – so the basic idea is easily summarized and has been a concept with success from the start. The engine of the 350 XC-F features a compact and very light (58.6 lb.) construction. Featuring a new clutch, improved transmission and a re-designed and lighter DOHC cylinder head the engine is stronger than ever before. Lightweight titanium valves and DLC coated finger followers allow for lively but also very strong engine characteristics. Fitted with the latest electronic fuel injection system and electric starter, it has an even wider usable speed range, improved performance and incredibly efficient rideability. The 350 XC-F has a reworked cylinder head design featuring the same architecture as before but it lost 200gr of weight. The two overhead camshafts with a friction-optimized super-fine surface, finger followers with a DLC coating are taken over as well as four lightweight titanium valves (intake 36.3mm, exhaust 29.1mm). The flow rate has been maximized for an optimal power band, with outstanding performance across the entire range, which ends at an engine speed of 13,400 rpm. In the short cylinder, with a bore of 88mm, is a forged bridged box-type piston made by CP. Its piston crown geometry is adapted perfectly to the high-compression combustion chamber and stands out with its extra rigid structure, combined with a low weight. The compression ratio is at 14:1. Thanks to the low oscillating masses, the engine offers extremely lively characteristics. The 350 crankshaft features a stiff design and it utilizes a short connecting rod, contributing to the compact and light engine with a dynamic and efficient power delivery. A plain big end bearing features two force-fitted bearing shells run directly on the crank pin. This design is a major prerequisite for the extremely high engine speed levels and the unrivaled maximum power of the 350cc engine. Not only that, it enhances the engine’s durability, allowing long crankshaft service intervals – a customer benefit in respect of time, effort and cost. In order to balance the mass-forces, the 350 XC-F engine uses a multifunctional counter balance shaft, which at the same time drives the water pump and timing chain. The 350 XC-F is fitted with a unique electric starter as standard, which is well known as a clear advantage when it comes to crunch time in the heat of battle. A strong starter motor made by Mitsuba and the proven starter drive guarantees efficient and reliable starting. The 350 XC-F uses a new 5-speed transmission made by PANKL RACING SYSTEMS ensuring the highest durability and reliability level. There was no need to change the gear ratios that are perfectly matched to the power delivery of the large displacement engine. The successful powerhouse of the 450 XC-F has been reworked and features even more compact dimensions, further reduced weight to 59.5 lb. and a more efficient performance throughout the rev range. Fitted with a newly designed, extremely compact single overhead camshaft cylinder head and the latest electronic fuel injection, it is distinguished by unrivaled power and a highly efficient power delivery. And last but not least including the super-beneficial electric starter this model is the lightest 450 engine on the MX market. The 450 XC-F is fitted with a newly developed SOHC cylinder head which is much more compact, 15mm lower and 500gr lighter improving the mass centralization. The gas flow through the newly shaped ports is controlled by a new overhead camshaft which is now closer to the center of gravity improving the handling. It features an improved cam surface and a shorter valve timing for better responsiveness. It activates four ultra-lightweight titanium valves (intake 40mm, exhaust 33mm) via extremely rigid rocker arms, which are DLC coated on the intake side allowing engine speeds of up to 11,500rpm. New low-friction chain guides contribute to reduced friction. The new head configuration guarantees a more efficient power delivery and an unrivaled performance of the large displacement KTM engine. In the short cylinder, featuring a bore of 95mm, is an extremely lightweight box-in-box type piston that delivers a major contribution to the engine’s low vibrations and engine-speed strength. The compression ratio is 12.75:1. The 450 XC-F’s crankshaft is located in an ideal position close to the center of gravity contributing to an easy bike handling. It utilizes a short connecting rod, which contributes to an overall compact and light engine with a snappy power delivery, while a well-balanced inertia supports the traction and rideability. A plain big end bearing with two force-fitted bearing shells runs directly on the crank pin. The necessary oil feed for this bearing is ensured by the engine’s pressure lubrication. This design is a decisive customer benefit in terms of the crankshaft service interval, which can be lengthened due to the plain bearing. 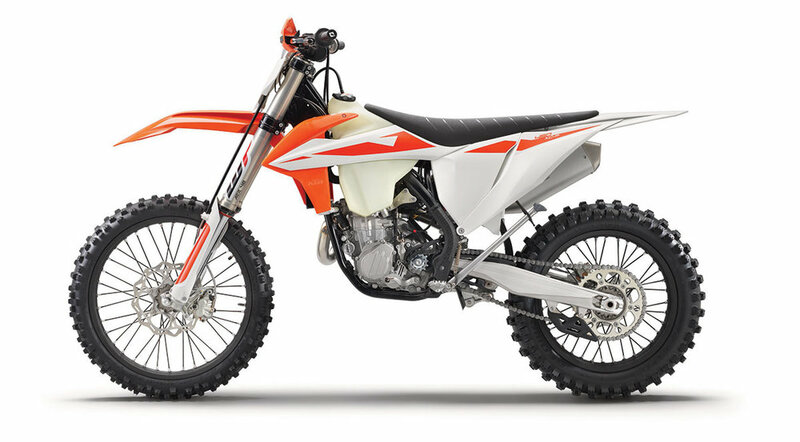 Like all KTM 4-stroke motorcycles, the 450 SX-F is started with ease by pushing a button. Especially in the heat of a motocross battle, as demonstrated time and time again, an electric starter can become an invaluable advantage. 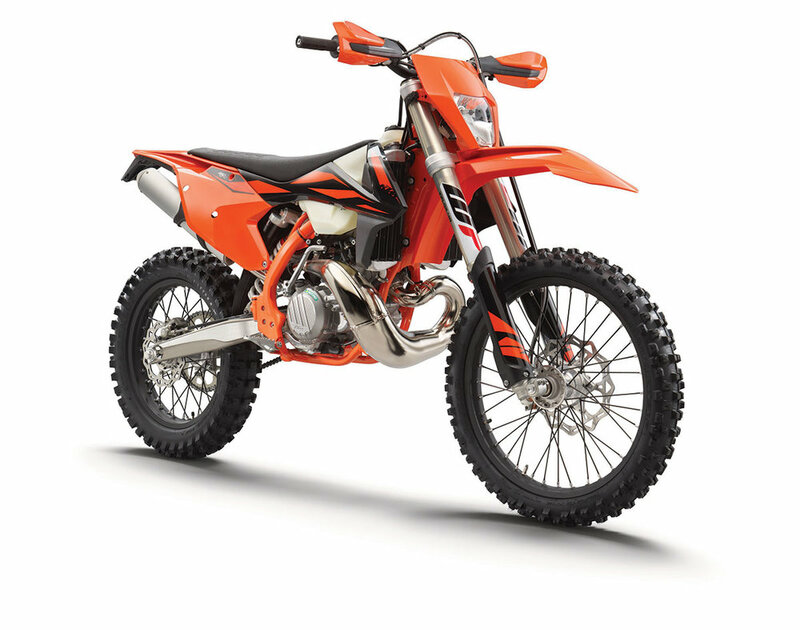 The 450 XC-F employs the KTM-developed DDS clutch (damped diaphragm steel) with a wear-free steel basket and extremely heat resistant clutch plates. This design is distinguished by employing a diaphragm spring instead of the usual coil springs, which makes for a considerably easier clutch action. The diaphragm spring also leaves sufficient space for a damping system integrated into the clutch hub, which benefits for both traction and durability. The hydraulic Brembo clutch mechanism offers light operation and highly controllable modulation of the clutch. The 450 uses a new 5-speed transmission ensuring the highest durability and reliability level. There was no need to change the gear ratios that are perfectly matched to the power delivery of the large displacement engine. KTM sets the benchmark in terms of 2-Stroke technology with its vast range of race winning motocross bikes. While many manufacturers may have turned their back on the development of the lighter weight range, KTM’s success in numerous off-road competitions with these motors, and especially for junior racing, is second to none. KTM provides a full range of motorcycles with the intention of ensuring the junior can progress through the ranks with the same brand they are accustomed to from an early age. They are excellent alternatives for all those who search for an easy to ride off-road bike with an outstanding power-to-weight ratio and a less demanding technology compared to the 4-strokes. For MY 2019 all models feature all-new chassis and lot of detail improvements making these bikes even faster than before. The engine of the 250 and 300 XC is known to be the most powerful and most competitive 2-stroke engine of the class. 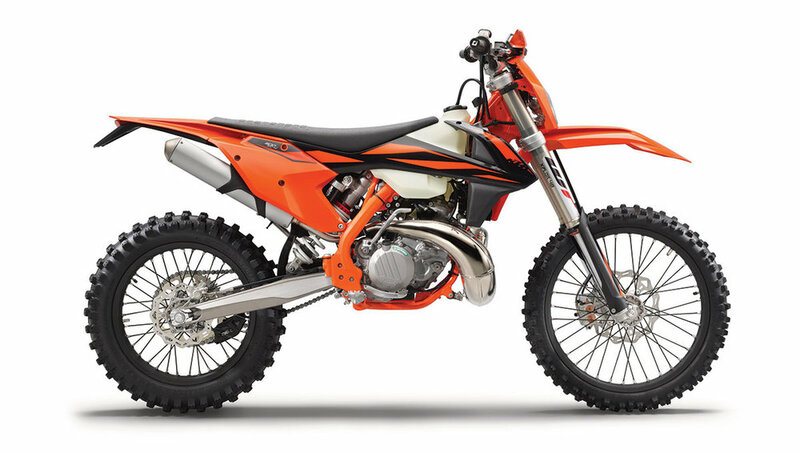 The new KTM engine features a cylinder with twin-valve controlled power valve, a counterbalance shaft for low engine vibrations, a 6-speed transmission, and a hydraulically operated DDS clutch. Thanks to refinements of the cylinder and exhaust the 250cc powerplant shines with outstanding performance and is the right choice for everybody who loves low purchasing and maintenance costs and the typical 2-stroke sound. The cylinder of the 250 SX with a bore of 66,4mm is fitted with a Twin-Valve power valve system which features a machined exhaust port for more precise function of the power valve improving the power delivery for MY19. The power characteristics can be changed within a few seconds thanks to two supplied springs allowing optimal settings to different tracks and rider’s preference. The lateral cylinder head brackets allow a more efficient fixation of the engine to the frame via 2 head stays reducing the vibration level which are now made of aluminum instead of steel. The engine is fitted with a 5-speed semi close gearbox with the optimal gear ratios for any kind of riding. The so-called “NO DIRT” gear lever design prevents dirt from blocking the joint of the lever guaranteeing always safe activation of the transmission. The engine is fitted with a lateral counterbalance shaft in order to reduce the vibration level. This lowers the stress level for the rider making the ride more comfortable and enjoyable. The engine features a reworked water pump casing in order to optimize the flow of the liquid for more efficient cooling. The 250 SX employs the KTM-developed DDS clutch (damped diaphragm steel) with a wear-free steel basket and extremely heat resistant clutch plates. This design is distinguished by employing a diaphragm spring instead of the usual coil springs, which makes for a considerably easier clutch action. The diaphragm spring also leaves sufficient space for a damping system integrated into the clutch hub, which benefits both traction and durability. The hydraulic Brembo clutch mechanism stands for light operation and highly controllable modulation of the clutch. The 38mm flat slide carburetor provides smooth and controllable power delivery and guarantees optimal performance over the entire range. A new carburetor setting is adapted to the new airbox and exhaust design. The 250 and 300 XC is fitted with a new exhaust system featuring a newly designed exhaust pipe and the muffler. The pipe produced with the latest WP 3-D stamping technology allows for more ground clearance and features reduced width making the entire bike more compact. And in conjunction with the reworked internal design of the silencer the power delivery and engine performance have been further improved. In addition, the plastic fixing system of the muffler is replaced by welded aluminum brackets reducing the weight of the muffler slightly. KTM has a long tradition of making high-end off-road competition motorcycles. The 250 and 300 cc XC-W TPI models are now both fitted with the revolutionary TPI serial fuel injection and have set new standards in the 2-stroke off-road segment. TPI stands for „transfer port injection”; a global-first, groundbreaking technology for 2-stroke racing engines that delivers a previously unattainable combination of top performance and outstanding rideability. No more jetting combined with a massive reduction of fuel consumption while the lubrication is taken care by an electronically controlled oil pump instead of using premix. The frames of all KTM off-road models are manufactured from lightweight sections of top-quality chrome-molybdenum steel tubing of various cross sections. This type of frame design provides high torsional rigidity for best handling and rideability, while a certain longitudinal flexibility can absorb the wheel impact energy, supporting the suspension for reduced rider fatigue. At the same time, the frame triangle serves to deliver the coolant from the cylinder head directly to the radiators. In the TPI models, the frame design also serves to route engine oil from a filler cap assembly, located between the fuel tank and the steering head, via a hose inside the upper frame tube to the oil tank. All EXC models are fitted with the latest WP XPlor 48 upside-down forks, a split fork design developed by WP Performance Systems and KTM. It is fitted with springs on both sides but separate damping functions. Compression damping is on the left and the rebound on the right-hand side without influencing each other. Therefore damping can easily be adjusted via the dials on top of both fork tubes with a range of 30 clicks each. Already distinguished by the outstanding response and damping characteristics the fork features an updated slightly stiffer setting for model year 2019 keeping the front end higher and providing increased reserves against bottoming out. Fitted to all EXC-F and XC-W models, the WP XPlor PDS shock absorber is the key element of the proven and successful PDS rear suspension design (Progressive Damping System) where the shock is directly linked to the swing arm without an additional linkage system. Optimal damping progression for offroad duty is achieved by a second damping piston in combination with a closed cup towards the end of the stroke, and supported by a progressive shock spring. This means the XPlor PDS shock provides excellent damping performance and a high resistance against bottoming out. An updated main piston and new settings provide improved damping characteristics and match perfectly the reworked front end set-up. Fully adjustable including high- and low-speed compression you can set the shock to any track and riders preferences. BREMBO brakes have been the standard equipment on KTM’s off-road range forever, and combined with the lightweight Wave discs with diameters of 260 mm front and 220 mm on the rear wheel, they remain the class-leading system when it comes to that crucial combination of stopping power and a transparent brake feel. KTM’s proven cooling system routes the coolant from the cylinder head through the frame triangle directly to aluminum radiators made by WP Performance Systems. Due to flow calculated internal circulation and CFD optimized air ventilation, the system is superbly efficient. In addition, well thought-out radiator guards guarantee excellent protection against mud while at the same time serve as efficient crash protectors. All EXC-F’s are fitted with a radiator fan as a standard feature. KTM’s advanced ´No Dirt´ foot pegs prevent clogging up the pegs, even when digging into the side walls of deep ruts. With the specifically designed pegs for the EXC models the rider stands six millimeters higher than the ones used on SX versions for increased ground clearance. They are easy to swap though if so desired in case a rider prefers a lower position. Combining top performance and outstanding rideability, the KTM 250 and 300 EXC TPI are distinguished by the lowest weight in their class, intuitive handling and a unique style, along with the awesome READY TO RACE performance. TPI stands for „transfer port injection“, and the groundbreaking new 2-stroke technology represents another major step forward on a global scale, once again demonstrating KTM’s unrelenting and continuous commitment to 2-strokes as such. The benefits to owners are clear: besides huge improvements in fuel efficiency and clean exhaust emissions, the electronics do away with the need for re-jetting, no matter the elevation of the race venue, prevailing weather conditions and the like. Also, engine lubrication on the TPI models is automatic from a separate oil tank and electronically controlled oil pump, obviating the use of pre-mixed fuel-oil mixture. The 250cc and 300cc 2-stroke generations have been known and respected for offering the most powerful 2-stroke performance in its segment. For MY2018 though, KTM underscored its continuous commitment to 2-stroke technology with its revolutionary TPI fuel injection. In combination with its state-of-the-art engine design, these power plants are even more refined than ever. The compact 2-strokes are a great choice for advanced off-road rider’s conscious of their purchasing and maintenance budget. The 250/300cc cylinders are fitted with the sophisticated TVC exhaust control and have a bore diameter of 66.4 and 72.0 mm. For the fuel injection, they feature two lateral domes holding the fuel injectors that inject fuel into the rear transfer ports. This downstream injection guarantees excellent atomization of the fuel with the upstreaming air for a highly efficient combustion and significantly reduced losses of unburned fuel. The engine management system’s intake pressure sensor is connected via a small-diameter tube in the back of the cylinder. The TPI engines are fitted with a 39 mm throttle body made by Dell’Orto. Power is controlled by a throttle valve while intake air data is provided to the engine management system by a throttle position sensor. An adjusting screw allows the idle speed to be set and a cold start device is provided, opening a bypass to supply extra air. Oil supplied by the automatic oil pump via an oil suction pipe is mixed with the incoming air to lubricate the moving engine parts. An oil pump mounted underneath the oil tank delivers the lubricant to the throttle body, where minute quantities are mixed with the incoming air in order to lubricate the moving engine parts. Using engine speed and throttle position sensor data, the engine management system’s precise electronic control of the oil pump ensures the perfect amount of oil for any given conditions, loads and engine speeds is added. The filler cap assembly for the oil tank is located between the fuel tank and steering head, utilizing a hose in the upper frame tube to conduct the oil to the storage container. Automatic, electronically controlled oil injection reduces exhaust smoke by up to 50% over conventional pre-mix lubrication, with an average fuel-to-oil ratio of 1:80. This means the oil capacity of about three-quarters of a quart is sufficient for at least five tanks of fuel. The KTM 250 XC-W TPI and 300 XC-W TPI models feature the most modern engine management system (EMS) of any 2-stroke off-road motorcycle. The electronic control unit is located below the seat utilizing various sensor data such as intake and ambient air pressure, throttle valve position and water temperature, the control unit optimizes ignition timing and the amount of fuel to inject. Thanks to its automatic altitude and temperature compensation, there is no need for the rider or mechanic to set up the bike for the prevailing environmental conditions. An optional map-select switch allows the rider to select an alternate map, providing a smoother power delivery. In addition for the 300 XC-W TPI the dealer can flash a RACE map to be activated as the alternative map. The rugged 6-speed transmission features widely spaced gear ratios optimized for offroad duty. It provides precise and easy shifting. The KTM ‘No Dirt’ gear shift lever design prevents dirt from blocking the joint of the gear shift lever for safe and reliable shifting in any conditions. Comprising three models which are very different and yet united by KTM’s pursuit of quality, the EXC-F range of off-road models are street legal. The 250 EXC-F DOHC engine has a very compact and lightweight design and delivers class-leading torque and power figures across the entire power band all the way up to 12,800rpm. Its compact architecture contributes to an excellent mass centralization, supporting the rideability of the bike. In addition, it only weighs 60.8 lb. That is including the incredibly beneficial electric starter. The 250 4-stroke transmits its unrelenting power through a 6-speed transmission with gear ratios specifically optimized for its power delivery. An advanced KTM ‘No Dirt’ gear lever design prevents dirt from blocking the joint of the lever, contributing to secure gear engagement. All KTM 4-stroke EXC-F’s feature a gear sensor to sync up the engine’s power curve to the currently selected gear as well as the surface conditions. When optimum rideability and maximum offroad performance are called for, there is no substitute for the KTM 350 EXC-F. Combining the handling of a 250 with power closely approaching 450 levels, its compact, powerful DOHC engine, low weight and perfectly tuned suspension make sure this machine masters each and every challenge with ease. And thanks to its playful agility, the 350 EXC-F retains the advantage when the going gets really tough. The longer the distance, the more riders on all levels benefit from its low-fatigue design for maximum riding fun. The 350 cm³ 4-stroke engine with a state-of-the-art electronic fuel injection system offers a very wide power band and is distinguished by a dynamic but low-fatigue power delivery. At the core: a highly sophisticated DOHC cylinder head with DLC-coated finger followers and flow-optimized ports, as well as a highly rigid, box-type, 88 mm piston. At the same time, the engine’s compact architecture helps to group the masses tightly around the bike’s center of gravity for outstanding rideability. All of this makes the 350 EXC-F brilliantly suited to both amateur riders as well as consummate pros. A rugged 6-speed transmission, wide gear ratios and a special low-friction coating on the shift forks serves to transmit the power of the 350 EXC-F to the rear wheel. The gear lever is protected by its advanced KTM ‘No Dirt’ design, preventing debris from blocking its joint for a secure gear engagement at all times. A gear sensor syncs up the engine’s power curve to the currently selected gear as well as the surface conditions. The 500 EXC-F’s fuel-injected powerhouse is the most compact and lightest 500 on the market while delivering awesome torque and power across the power band. The four valves of the SOHC cylinder head are controlled by extremely rigid rocker arms while flow-optimized ports ensure an efficient gas exchange. Vibrations are kept in check by a carefully optimized crank drive with plain bearings, as well as a multifunctional balancer shaft. The cutting-edge Keihin engine management system with electronic fuel injection and a 42 mm throttle body ensure an astonishing response. The 6-speed transmission of the 500 EXC-F is fitted with all the latest trimmings, from the gear sensor supporting the engine management to friction optimized shift forks and gear wheels, to the ingenious KTM ‘No Dirt’ gear lever, unfazed by any kind of debris for a secure gear engagement.